Writing my final year thesis on The Nigerian Civil War Literature, focusing on Chimamanda Ngozi Adichie’s Half of a Yellow Sun and Isidore Okpewho’s The Last Duty exposed me to some elements of the Biafran war I did not know. My father and my grandmother always told me stories about the conflict, which saw over 2,000,000 people dead. However, I was not fortunate to hear my grandfather’s side of the story – he was long dead before I was born. 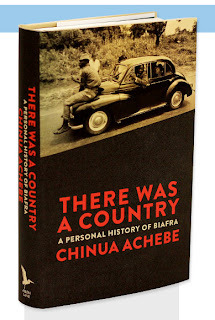 Now Achebe is back with an extremely important document. I was captivated by the subtitle of the book; a personal history of Biafra. Fortunately, a good friend of mine sent me a copy and I read the book while I was convalescing after an accident. Achebe starts the book with an introduction of a time before his time, because according to an Igbo proverb, “a man who does not know where the rain began to beat him cannot say where he dried his body.” He talks briefly about the discovery of Africa by Europe four to five hundred years ago, then the transatlantic slave trade, to the Berlin Conference of 1885, which began colonialism in Africa. The book is divided into four parts. Part One talks about Achebe’s birth and coming into a world at “cultural crossroads”, where the clash between African and Western civilization had generated deep struggles between languages, cultures and religion. He talks about his orphaned father, a clergyman, and his mother, whom he says is “the strong, silent type.” Brought up in an environment where Christianity was trying to get its foothold and African religion was striving to survive despite the new religion, Achebe becomes a little skeptic about his parents embracing customs and beliefs of strangers from thousands of miles away, the same strangers who “delivered us to the transatlantic slave trade and unleashed darkness in our world.” These struggles between the old and the new would come to be the themes inherent in some of his early novels. He goes on to talk about his school days and the publication of his first book, Things Fall Apart, a novel which has sold 12,000,000 copies worldwide and translated into more than 50 different languages. The call for independence began, and years later a new republic Nigeria is formed, run by Nigerians themselves. That independence was literally the beginning of troubles even though there was optimism in the air then in the new country. Within six years of independence, corruption and misrule was at its peak, as public servants and government officials helped themselves with money for the nation. In 1966, there was a coup, one that many labeled an Igbo coup. The coup resulted to an organized massacre of the Igbos, mainly in the Northern part of the country. The Nigerian Government did nothing about the massacres. Even in Lagos, the country’s capital, things were not different, as many Igbos were returning to the East. Achebe has this to say; “As many of us packed our belongings to return east, some of the people we had lived with for years, some for decades, jeered and said, ‘Let them go…’ I realized suddenly that I had not been living in my home; I had been living in a strange place.” July 29, 1966 came a counter coup, led by General Murtala Mohammed which ousted Major-General Aguiyi Ironsi from power and saw him killed. This coup had other Igbo officers and civilians killed in large numbers. By this time, there were calls for independence by the Igbos, and so the republic of Biafra was established, precipitating the start of the Nigeria/Biafra War. Part Two and Three deals with the war. Achebe talks about the allies of both nations, the neutrals, the United Kingdom and the role they all played. He also talks about his travelling as an ambassador on behalf of Biafra, his nation. One particular account I found very interesting was his meeting and discussion with Senegalese President, Leopold Sedar Senghor, who was a poet too. His narrative about his family moving from place to place due to air raids and the invading Nigerian forces, though distant, is very touching. There were many instances of near-misses. He talks about starting the Citadel Press with his close friend, Christopher Okigbo. Later Okigbo disappears and joins the army. While driving from Enugu to Ogidi one afternoon, Achebe hears the death of his friend death on the radio. By this time, Biafra was suffering a setback because of the economic starvation and blockade. Here, the Nigerian government uses starvation as a weapon of war, going against the Geneva Convention of 1949. The blockade resulted in the death of over 2,000,000 people, especially women and children. First we have to nurture and strengthen our democratic institutions – and strive for the freest and fairest elections possible… Under the rubric of democracy, a free press can strive and a strong justice system can flourish… A new patriotic consciousness has to be developed, not one based simply on the well-worn notion of unity of Nigeria or faith in Nigeria often touted by our corrupt leaders, but one based on an awareness of the responsibility of the leaders to the led – on the sacredness of their anointment to lead – and disseminated by civil society, schools, and intellectuals. Overall, the book was an interesting read. I enjoyed it, but I longed for more of Achebe experiences during the war. Most of the stories in Part 2 and 3 seemed like stories I have heard repeatedly. I wanted to hear more of Achebe’s story, and not the war story. Although a satisfactory narrative, I was hungry for more, which made me read the book in a slow pace as if I was eating a hot meal. Somehow, I did not want the book to finish. The chapters are brilliantly written in Achebe’s conversational prose style, and interspersed with poems, which, although I have read before, provided much of the emotional connection that held me to the book. These poems, in my opinion were put in the right place or the right time, and if the narrative did not hook me well, the poems did. I recommend this book to all, and anyone interested in the history of not only Biafra, but also Nigeria and Africa as a whole. Everybody who has read Professor Achebe’s other books ought to read this one too. Hi, guys. Been a long time. I was involved in an crash, fractured my right leg. I'm recuperating at the moment, but I believe I'm back to normal blogging. I miss blogging here; miss you guys most. Posting my accident story next.